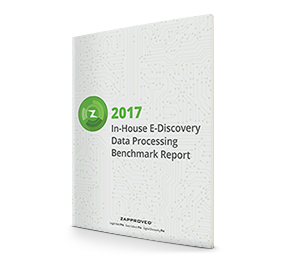 Get the 2017 In-House Ediscovery Data Processing Benchmark Report! Discover the biggest influencers on data processing decisions today — and how to apply those findings to elevate success in 2017. The new 2017 In-House Ediscovery Data Processing Benchmark Report is here! Tap in to find out the most satisfying and concerning aspects affecting data processing for ediscovery today — and tomorrow. These insights can offer a roadmap to create better, more efficient data processing and review approaches in the year ahead. Each year, Zapproved produces a report on the the state of in-house ediscovery, based on a short survey. Participants include a range of in-house ediscovery professionals, from IT personnel to legal operations staff. The 2017 In-House Ediscovery Data Processing Benchmark Report reveals participant satisfaction with data processing speed, cost, ease of use, security and risk reduction. These attributes are correlated with business criteria, such as case types, matter sizes, data sources and future trends. Use these findings to optimize your data processing approach and strengthen your ediscovery program.